Activision Co-Founder Says Anti-Activision Sentiment is "A Little Bit Strong"
Activision co-founder Alan Miller thinks the anti-Activision sentiment so prevalent among gamers these days is "a little bit strong," saying that a lot of people don't understand just how tough it is to be a major game publisher. It's no secret that a lot of gamers don't like Activision or its oft-blunt CEO Bobby Kotick, well known to many as the man who said he wanted to "take all the fun out of making videogames." But Miller, a game designer who left Atari to co-found Activision in 1979 and then moved on to launch Accolade in 1984, thinks a lot of gamers fail to appreciate the hard business side of the publishing game and the need to ensure that its releases remain profitable. "Well, I think it's a little bit strong, that reaction," he said about the widespread antipathy directed toward Kotick and Activision. "It's very difficult to be a games publisher - your objective is to make enough money to continue in the business and make new games. I know they're not a very extravagant company; I know several people that work there who don't have plush offices - and they try to create wonderful products." "But as a publisher, you're taking the risk - and it's not just the development risk, it's also the marketing risk," he continued. "It's a very expensive proposition, and you don't have the luxury of putting products into the market that you don't think are going to perform and be profitable." Activision's decision to pull the plug on the Guitar Hero franchise, which former RedOctane chief Kelly Sumner said the publisher "abused" in its effort to maximize short-term profits, was actually a reflection of a more fundamental shift in the game industry from retail to digital distribution, Miller said. "Guitar Hero specifically had a big problem in that it required pretty expensive peripheral prices to really enjoy it - and that's a much more viable sale at retail, where the peripheral can sit right next to the box," he explained. "It's hard, in my opinion, to get a lot of the more casual players to spend $100 for a guitar, just to play a game." It's a valid position, although I think it overlooks more obvious factors in the decline of Guitar Hero and the music genre as a whole, like the largely intractable problem with saturation. On his wider point, however, he's dead on; games may be art but Activision is a business, with quarterly profit statements and shareholders to keep happy. 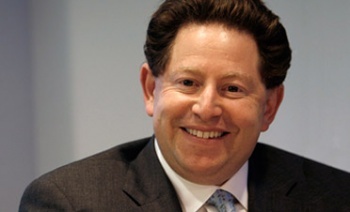 Gamers may not like how Bobby Kotick rolls but his shareholders do and at the end of the day, that's what counts.